The continued promotion of indigenous development policies that discriminate against foreign technology companies continue to hinder China’s cloud computing readiness progress. China does not follow international models in key areas that are relevant to cloud computing. For example, the privacy and security provisions in the 2015 National Security Law and 2016 Cybersecurity Law are controversial and have been the subject of extensive international debate. Key concerns include data localization mandates, extensive and duplicative tests, audits, and certifications. These concerns are exacerbated by pending and/or unclear implementing guidelines. China achieved the lowest results from all countries in the areas of international standards and it also scored very poorly in the section on free trade promotion. China imposes a range of onerous local certification and accreditation requirements that are in addition to (and often inconsistent with) international cybersecurity standards and general IT standards. China also imposes local testing requirements for cybersecurity products. Extensive regulation of Internet content, including mandatory Internet filtering and censorship, remains a key issue in China. China’s poor results in relation to laws and regulation were partly offset by strong progress in IT infrastructure, which explains the slight improving in its ranking — from 23rd place to 22nd place. 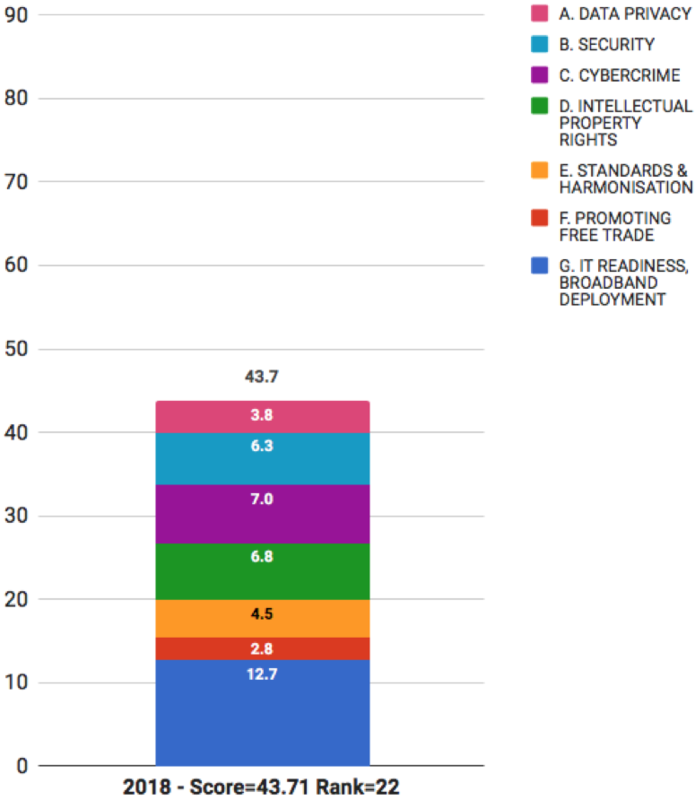 - 15th for IT readiness and broadband deployment.